Preparations for the upcoming 17th Lok Sabha Elections – 2019 which is underway in Manipur where 19,30,912 voters are expected to exercise their franchise across 2,861 polling stations to elect two parliamentarians is likely to be completed by February 15. This was informed by the chief electoral officer (CEO) P K Singh on Wednesday. Forty four polling stations were increased this time compared to last time. Speaking to reporters on the sideline of conducting a lucky draw for all participants of Electronic Voting Machines (EVMs) and Voter Verifiable Paper Audit Trails (VVPATs) familiarization drive in Imphal on Wednesday, CEO Manipur P K Singh said that the Chief Election Commissioner (CEC) has given strict instruction that the election has to be a top priority and the poll related works to be executed in full swing. Instructions have also been given regarding the posting and transfer of government officials to be completed at the earliest by February 28, he said informing that a detailed video conference with the CEC and the state officials led by chief secretary Dr J Suresh Babu and DGP L M Khaute including representatives of different security agencies was held on Tuesday. Regarding the rumours on poll dates on social media, he said the election dates will be known after the formal announcement by the CEC who is expected to visit the State in a fortnight. 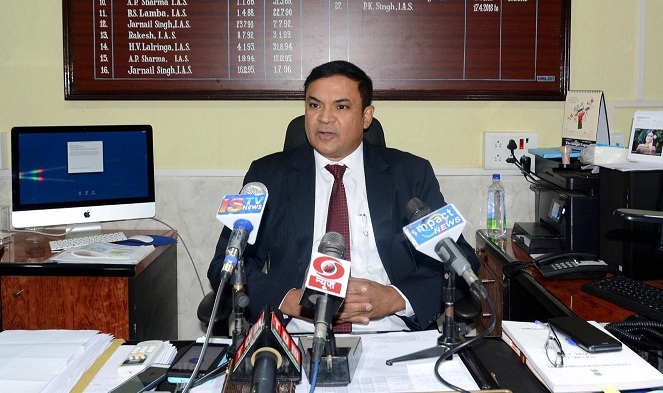 Expressing hope that the district election management plans will be ready by January 31, CEO Singh said that the identification of poll personnel is underway adding that all the tenders are completed, required materials are procured and some others are in the pipeline. More than 4,000 EVMs are already placed in the strong room and they are being checked by over 20 engineers of the Bharat Electronics Ltd. Last batch of 1,000 VVPATs will be brought from Bangulury, he said assuring that there is an adequate reserve of EVM. On security arrangements, he said that 79 companies of paramilitary forces including 39 companies from the State were used in 2014 election. Similar arrangement is expected this time too. On awareness campaign of EVM and VVPAT, he said different teams were sent with EVMs and VVPATS and conducted awareness campaign in all 2,861 polling stations in two and half months.